If you do any digital marketing, you know that you need to have some tracking software installed on your site so that you can properly analyze visits to your site. For most people, Google Analytics is the tool of choice. It’s not enough though to just add the tracking code to your site and call it a day. There are customizations that need to be made to ensure that you’re collecting accurate data. Marketing decisions made with inaccurate data are akin to using the spray ‘n pray method. What if you identify your most common visitor, but it turns out that they’re an employee who uses the site at work? What if referral spam is skewing your goal conversion rates? Worse yet, what if you don’t have any goals set up at all? Your homework for this week will be to dive into your Google Analytics reports and make sure that you aren’t making these mistakes that are killing your marketing data. Before anything else, ensure that you have the correct tracking code installed on every page of your website (even the 404 page), once and only once – installing the code twice will skew your data. The main red flag for this is pages on your site showing an unusually low bounce rate (around 2%). You should always keep one, pure, unfiltered, ‘raw’ view in Google Analytics. Filters are destructive by nature and can result in data loss if applied incorrectly. One day that raw view may save you from disaster. If something goes wrong, you’ll be able to reference that raw data to find the cause. KPI stands for Key Performance Indicator and, in short, it refers to the pieces of data that you’re going to look at to determine how your site is performing. KPIs differ per business, but they should all tie back to your business goals. If you’re looking at the wrong KPIs then you can’t accurately measure the performance of your goals. Selecting the right KPIs for your business will get your started down the right path for analyzing your website data. You want your analytics data to reflect your marketing audience, not you and your staff. So remember that employee who uses the website as part of their job? You need to filter them out of your data along with anyone else who regularly visits the site but isn’t a potential customer. This can represent a large portion of your traffic and can skew your data so should be excluded. You can do this by setting up a IP exclusion filter. Have you ever noticed a spike in traffic only to dig into the source and find out that it was a referral from a site like site-auditor.online or monetizationking.net? While it might be tempting to leave this bogus traffic in to inflate your overall pageview, that’s a really bad idea. Firstly, they’re not legitimate visits so pageviews that include them are purely for vanity. Secondly, leaving them in will skew any data analysis such as goal conversion rates making your numbers look worse. There are a few different ways that you can filter this traffic out – ask us about our favourites. It’s starting to feel like we’re asking you to exclude more and more information, but trust us, we just want you using the truest, most accurate version of your data. So next you’re going to exclude query parameters from your URLs. A query parameter (like a session ID, visitor ID, etc) is what can appear after the question mark in a URL. Google Analytics considers one base URL with different query parameters as two different web pages. If the query parameter isn’t changing the content/functionality of a web page then you should exclude it so as to not split your reporting rows. This can be done in the View settings on the Admin screens. Even if you don’t run an eCommerce site, you have your website for a business reason, whether it’s brand awareness, lead generation, or actual sales. Setting up goals and conversions will help you determine if you’re reaching your targets. Without a goal, any further data analysis is pointless. So you have an eCommerce website, but you haven’t enabled eCommerce tracking in Google Analytics? Tsk, tsk. Without that data you won’t be able to get a complete picture of the performance of your site or be able to determine if your marketing efforts have been successful. Not everything that you need to know about how your visitors use your page can be told through pageviews. For some things, you need to create and track events. How many times was that PDF downloaded? Which email links get more clicks: ones in the header or the footer? How many times was your promo video played? How many times was that email form without a thank you page used? For this, you need event tracking. Events are great on their own but they’re even more powerful when you combine them with Goals. In the eyes of Google Analytics, traffic to your site is either direct or a referral. That’s it. When looking at the referral traffic, Google is kind enough to give you a bit more info like ‘source’ (eg. facebook, yahoo, google) and ‘medium’ (eg. organic, social, email) but if you want to know more than that you need to add campaign tracking variables to your links. Otherwise, how will you know which set of display ads lead to a conversion or which edition of your newsletter brought in the most return traffic? Google’s Campaign URL Builder is an invaluable tool for building this complex URLs to share. You can probably remember that last week you added a new filter but will you be able to remember and explain the change in data a year from now? Use attributions to track significant events like goals or filter changes, blog posts, company events, sales, unusual traffic spikes, and anything else that may affect overall traffic. 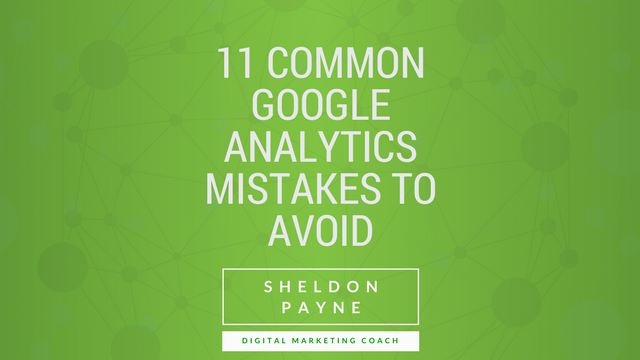 These are the 11 most common mistakes we see when looking at Google Analytics. Get them right and you’ll know that you’ve got a sound set of data to work with and can make good marketing decisions. Need some help getting your own Analytics account straightened out? We’ve got a training session for that!